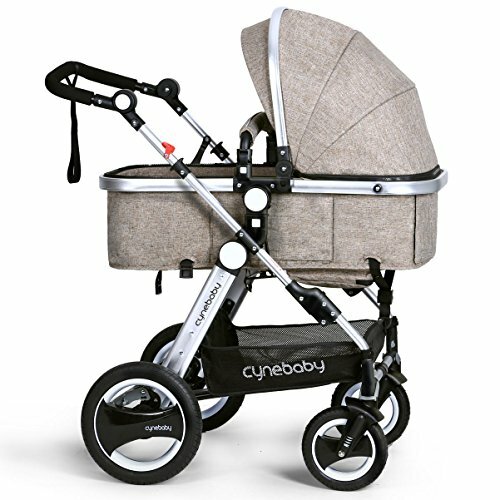 OUR GOAL: Everyone who bought our products would say "Cynebaby is a good choice!" OFFER GOOD SHIPPING: Fulfilled by Amazon or ships from the local warehouse (Canton, MA or Whittier, CA) by local logistics, such as UPS, FedEx or USPS. Fast delivery. TOP STRONG CUSTOMER SERVICE TEAM: Deal with any questions you ask, any dissatisfaction please feel free to tell us, we indeed solve it and improve it to make you satisfied. Feature vista city select stroller: away from vehicle exhaust, babies have a great view and parents don't have to bend over as much when interacting with their baby. playgrounds, the post office, the bakery and so on. Tool-free installation. Foldable luxury stroller frame closes compact and fits in your trunk. It is a STANDARD STROLLER not a LIGHTWEIGHT STROLLER. So it is a little big. The 4 wheels are made of original nat-rubber to make it durable for a long time, the smell of rubber is healthy. It cannot be carried on airplane. MORE FEATURES AND CONVENIENCE. Infant bassinet stroller changes to a toddler seat. 0-6 month sleep in bassinet, 7-36 month seat when out with mom; Adjustable full canopy with more sunshade reflects ultraviolet radiation. 2 styles, face to face with mom or facing out; 3 modes, 175 degree bassinet avoid vomiting milk, semi-recline & seat. AMAZING KITS AND GUARANTEE. Equipped with stroller accessories, baby stroller food tray, warm foot cover, cup holder, safe stroller wrist strap, baby seat cushion, mosquito net. 180-day money back. Lifetime warranty. Have a try, if not satisfied return at any time. Top customer service team offer best service to make you satisfied!